It's hard to call Pompeii a success, at least from a story perspective. Granted, the tale of the ancient Roman city that was demolished in 79AD when the nearby volcano, Mount Vesuvius, erupted has never been told in big-budget, cinematic form. As far as disaster epics go, the film hits all the melodramatic, high-end special effect notes with accuracy. However, it's the story wrapped around that successful disaster picture that is derivative and loaded with cliche. The obvious formula is Titanic meets Gladiator with that fiery, erupting volcano filling in for the iceberg, and while the intensity levels rise with all the liquid, hot magma of excitement, it all comes across as weighty as a pile of ash. Pompeii may be a cinematic achievement for the senses, but any lasting impressions it could leave instnatly begin and end with how impressive it looks. The "Gladiator" side of the story finds the film's hero, Milo (Kit Harington), following the obvious arc of slave to gladiator to defier of the Roman government. Milo is the last of his tribe, the rest of his family and people wiped out by Roman soldiers when he is a young boy. Years later, after the slavery and badass gladiator thing, Milo finds himself taken to the luxurious coastal city of Pompeii where frequent tremors and dust falling off the ancient buildings don't seem to have the inhabitants in too much of a worry. It is here that Milo meets and is instantly attracted to Cassia (Emily Browning), a woman whose standing with the upper class has nervous glares cast her way when she returns the infatuation for the slave. 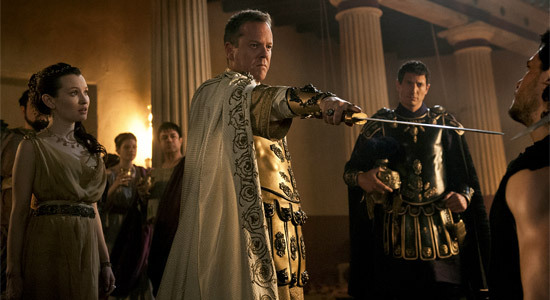 In order to appease Rome, as well as get a little money out of the Empire's coffers, Cassia's hand in marriage is promised to the visiting Senator Corvus (Kiefer Sutherland). As fate, and the art of movie storytelling convenience, would have it, Corvus was the leader of the wicked groups of Romans who wiped out Milo's family. A revenge plot quickly gets thrown into the mix, and that's even before smoke starts seeping out of the nearby mountain's side. From the very beginning the screenplay for Pompeii, written and then presumably rewritten by a handful of writers, feels like a story we've heard several times before. The Gladiator roots have been showing in sword-and-sandal epics for the last 14 years, and they don't show any signs of slowing their influence in the epics of today. At its heart, though, Pompeii seems to liken itself more a Titanic knockoff, the forbidden love story surrounded by disaster and tragedy enough of a screenwriting lift to warrant any more. That doesn't stop this film from piling on the tropes. There are so many shared character types between this movie and those from which it is lifting that it becomes a game of pointing them out. Here's "Lost" star Adewale Akinnuoye-Agbaje as the supporting gladiator from Africa who is, of course, wise beyond his years. There's Sutherland's high-ranking-yet-despicable antagonist whose character and story arc highly mimic that found in Titanic. To say the very least, Billy Zane would have been a perfect fit for the part. And the whole time the film bounces from familiar story beat to familiar story beat, the direction and execution on the film, particularly in the last half when disaster strikes, does their very best in holding the audience's attention. Pompeii is the latest directing effort by filmmaker Paul W.S. Anderson, the style-over-substance artist who makes sure we have a new Resident Evil in theaters every couple of years. For those worried, we're getting another one in 2015. Anderson is a hit-or-miss director, his hits generally of the "check your brain at the door" variety. Sure, Pompeii falls into that category, as well, but it's difficult to deny the film's strengths lie in how well Anderson pulls off his disaster epic. The special effects found in disaster movies through the ages have been among some of the best. In the modern age, computer graphics and digital effects have long since overtaken models and matte paintings. The successful examples of modern-age special effects keep you riveted to the screen regardless of what's going on narratively. Between the sheer amount, the execution, and Anderson's eye for editing that barely keeps the film in PG-13 territory, the special effects side of Pompeii is anything but a failure. In fact, it's this very element that keeps Pompeii as remotely exciting and as interesting as it is. At the very least, the gigantic explosions and cataclysmic moments of destruction serve as a nice distraction from the derivative revenge and shallow love story going on. Pompeii's more actiony side far outweighs the emotional side, decent but nothing special performances from Harington and Browning. Sutherland is going off the charts with his villainy, but it's far more laughable than it is menacing. That can pretty much sum up how Pompeii works as a whole. It offers some pretty spectacle to ingest on an otherwise boring afternoon, but don't expect this film to pop into your head whenever you hear the name Pompeii in years to come. Good Review Maybe the movie have some good mass destruction sequences but they definitely are NOT fantastic. In other hand Pompeii was ULTIMATE subject for a disaster movie that gone simply. Pitty. I think no one come to directing this true tragic accident in MY life again and that's too bad for me. MAYBE good for next generations. Sounds like an average rental to me. To be honest Paul ws Anderson is hardly a good director. He gets to make plenty of films but almost all lack a decent story. The films he makes are best to wait and rent. Does anyone else constantly mix up Paul Thomas Anderson and Paul W.S. Anderson? And hell, Wes Anderson too for that matter. I'm sitting here thinking, "man, this guy really fell off after making There Will Be Blood and The Royal Tenenbaums." haha It always annoys me too. i'm going in 30 minutes. no real desire to see the film, just need to get the hell away from my wife. The movie ended with me thinking, "Well.... there goes my AVX money. *sigh*".